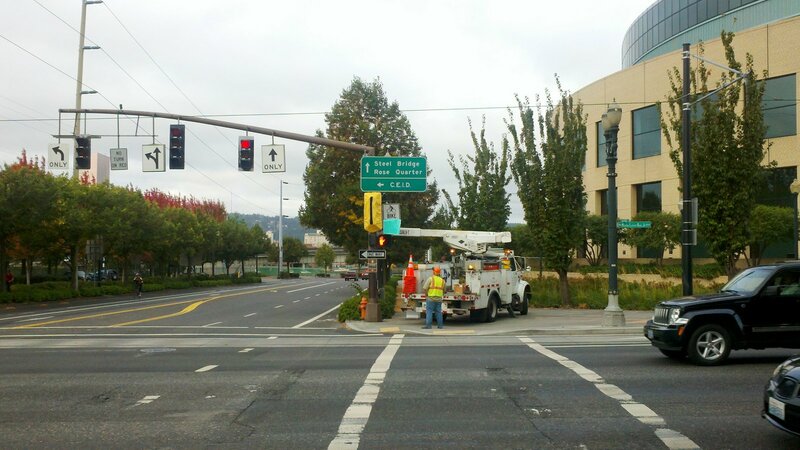 The newest bike signal (our 12th) was activated today when we added the bike signal sign and plugged in the load switch in the traffic controller cabinet. 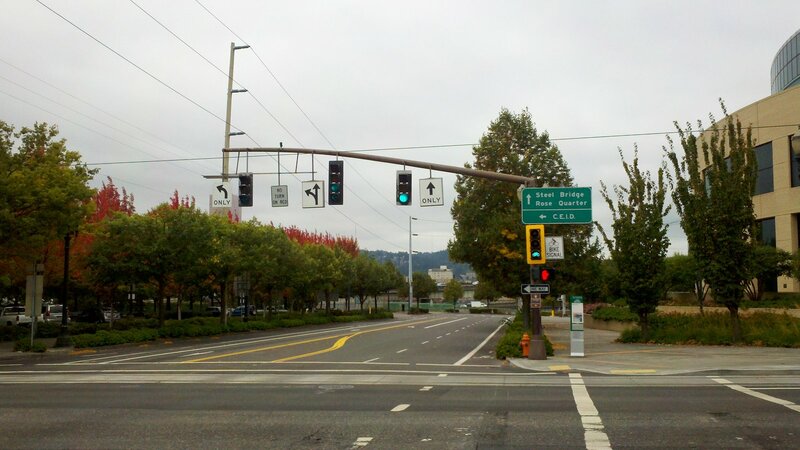 The bike signal was a simple addition to an intersection that allows a movement to occur that was stopped without any cause. The east-west street of the intersection is two-way and the southbound movement is one-way. In this sort of a configuration, the westbound people on bicycles can be allowed to move with the eastbound movement because there is no conflict. 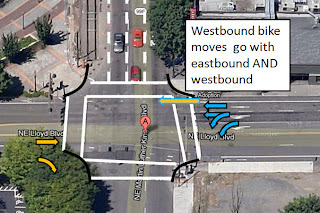 The eastbound movement conflicts with the westbound movements because of the lane configuration, but the bike in the curb tight bike lane clearly does not. 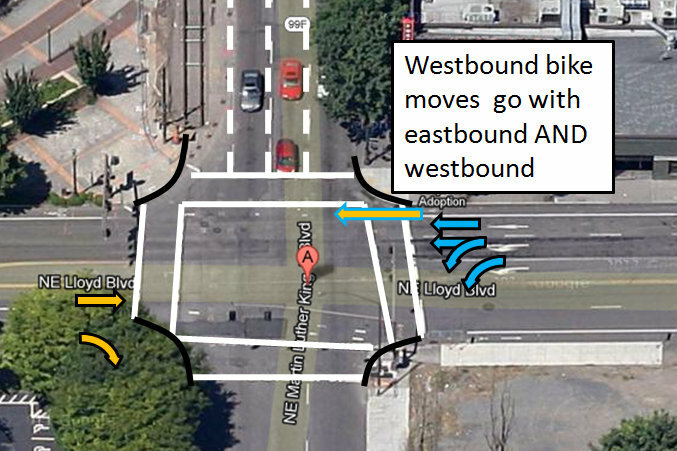 There is an access to the Eastbank Esplanade to the west of this intersection, so the leading bicycle interval for the eastbound movement allows people on bicycles to get the jump on the vehicle movements and weave across the lanes to turn onto the sidewalk that leads to the path. The series of photos shows the finishing touches that the Electrical Shop crew completed (mounting the bike signal sign and making sure that the signal was visible). The guide signs for CEID (Central Eastside Industrial District) and Steel Bridge were moved up the pole to make room for the bike signal. I often get asked what a change like this costs. 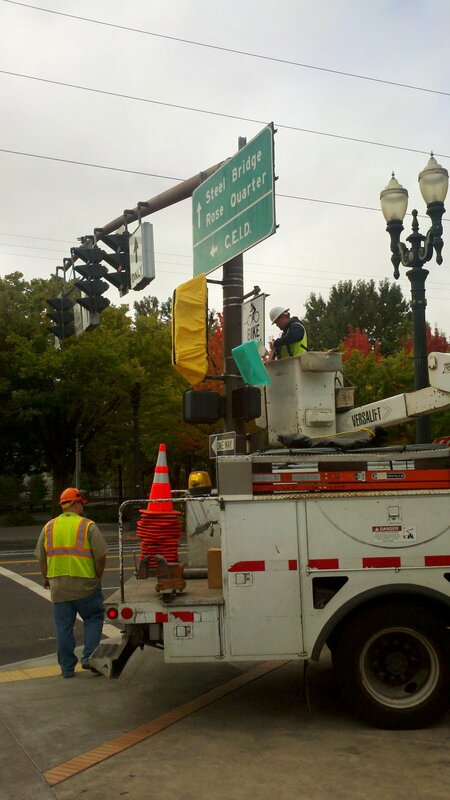 This one was particularly limited in its expense because the wiring was already there (we replaced an existing vehicular signal that was redundant) and the pole was placed in the exact spot needed for the display. 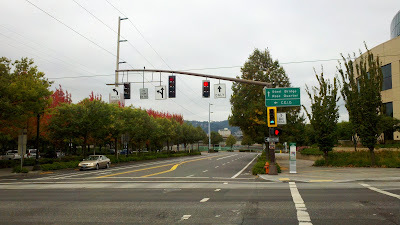 The length of the green time advance for the bicycle signal is dependent on the eastbound traffic. The bicycle signal westbound is active when the eastbound movement starts and continues when the eastbound vehicles start. Another way to think of this movement is that it mimics the WALK interval for pedestrians on the north crossing of the intersection. 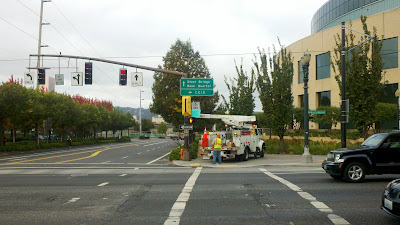 Nice coverage of the bike signal addition by BikePortland here at this link. Nice job on the low hanging fruit.